Zoë is a solicitor in the healthcare team at Hayes Solicitors. She works primarily in healthcare litigation, defending clinical negligence claims against public hospitals and private clinicians. Zoë is experienced in representing clients in the Circuit Court, High Court and Court of Appeal. At Hayes solicitors, Zoë assists in defending a varied caseload of medical negligence claims including claims alleging failure to diagnose, surgical mistakes and dental claims. She has experience in the areas of medical negligence, personal injury and commercial litigation. 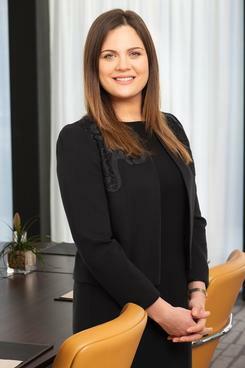 Zoë has acted on behalf of plaintiffs and defendants in the areas of employers’ liability, road traffic accidents, school accidents, cosmetic procedures and medical negligence. She has represented parties in claims concerning injuries of a catastrophic nature such as tetraplegia. Such claims required detailed assessment of liability, causation and quantum. She has also taken evidence on commission. Zoë has experience acting for insurance companies in arbitrations. Zoë previously practised as a barrister in the area of civil litigation. Zoë has given presentations on data protection, employer’s liability and discovery.